Is it as good as the MX100? Not the best performing SSD around, but not the worst either, the BX100 is a great choice for anyone who wants an affordable SSD. The Crucial MX100 is a great SSD. When I covered it six months ago, it offered an unrivalled price per gigabyte, making the majority of other SSDs seem overly expensive, given the slim difference they offer in performance, for what in some cases amounts to paying twice the price. Until the MX100 arrived, you couldn't buy a 512GB SSD for such a low price, least of all one which performed well too. It's obviously proved popular, since Crucial has followed it up with two new models – the BX100 and MX200. The BX100 isn't a radical departure from the MX100. Once again, it's not trying to be the fastest drive on the market, something Crucial even says in its own marketing literature. But it's similarly affordable, with roughly the same pricing as the MX100. Crucial has now added a 1TB drive to its line-up, a capacity that's now worth considering, given prices are so reasonable. This makes four capacities on offer, ranging from 120GB through 250GB and 500GB, to 1TB. The B stands for 'budget', with a few features cut from the BX100, and a different controller. The BX100 supports TRIM and garbage collection like most SSDs, although 256-bit AES hardware encryption has been removed along with power-loss protection. In its place is a new feature called Extreme Energy Efficiency, which Crucial says drops the energy consumption to 90% less than a hard disk, although goes into no more detail than that. Expect pretty low power consumption from the BX100. Like the MX100, it's based off 16nm NAND by Micron (Crucial's parent company) which is some of the smallest in the industry, but with a cheaper Silicon Motion SM2246EN controller instead of the Marvell 88SS9189. There's a MTBF of 1.5 million hours, with the same drive longevity of 72TB of writes, a reasonable amount for average home computer use. Speeds seem to be a bit lower – the 512GB MX100 is quoted as 550 MB/sec read and 500 MB/sec write, while the 512GB BX100 is quoted as 535 MB/sec read and 450 MB/sec write. With the lower capacities, there's about a 10% improvement with the BX100 though. IOPS figures are again a bit lower for the 512GB model, although there's a small improvement for the smaller capacities. The MX200 is different. It comes in a range of form factors, including mSATA, M.2 type 2260 (60mm) and 2280, along with traditional 2.5-inch SATA. The MX200 is quite a big upgrade, with much more impressive longevity, ranging from 80TB of writes for the 256GB model up to 320TB writes for the 1TB model. Not bad at all. 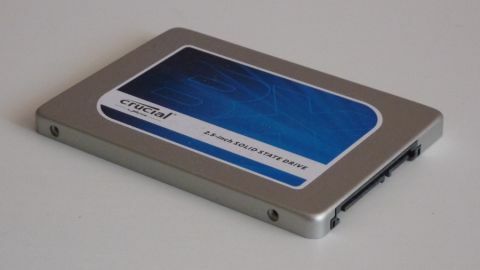 Crucial provided us with the 1TB version of the BX100 SSD, which usually offers better performance than a smaller capacity model – it retails for about £300 ($400 in the US, which is around AU$530). Write performance was notably worse than the 512GB MX100 I reviewed though, while read performance was slightly up. In CrystalDiskMark, the 1TB BX100 managed 522.8 MB/sec read speed, compared with 484.3 MB/sec for the MX100, a good improvement, potentially helped by the extra capacity. But write speeds of 458.9 MB/sec are lower than the MX100's 466.8 MB/sec. QD32 random writes were significantly lower too, going from 354.8 MB/sec to 305.1 MB/sec, and IOPS drops from roughly 90,000 to 80,000. This performance reduction was noticeable in ATTO as well, with about a 25% difference in small file size writes. In the 8K write test, the MX100 scored 419037, with the BX100 managing just 262766, one of the lowest scores I've seen – but I did see improved read speeds. AS SSD showed access times of 0.053ms read and 0.046ms write, an area of improvement over the MX100. In PCMark 8, a score of 4960 isn't the best I've ever recorded, but it's only marginally lower than top-end drives like Samsung's 850 Pro. It's a mixed bag of synthetic performance results then, with the BX100 mostly living up to its name of being a budget drive. The MX100 is superior, as are many other drives. However, there's nothing really terrible about the BX100 at all. In fact, in real-world use, you won't notice any difference at all, despite the slightly lower synthetic scores. Really, price per gigabyte is what counts now, since even with an affordable budget SSD you'll still enjoy fast boot times, responsive performance and quick application load times. Would I recommend a drive that costs twice as much over the BX100? Well, no. With an affordable drive like the BX100, it might make more sense to opt for a larger capacity instead. A high-end SSD such as the Samsung 850 Pro is not so much better that it's worth spending twice as much for, unless you're building a high-end workstation and demand the very best performance.